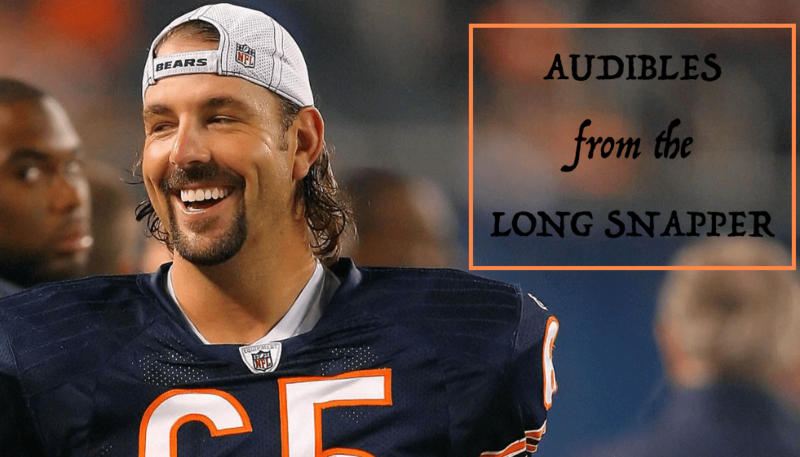 Audibles From the Long Snapper: Ireland, Aaron, Underdogs, Jim McMahon on DP Show & More! I am heading to Ireland for the next two weeks. But through the magic of the internet I will be posting right up until Saturday. Andrew Dannehy will be writing previews for each of the other teams in the NFC North next week and Reverend Dave may even be weighing in from time to time. I will return on Monday September 7th with my annual Fifty Prognostications, Pontifications & Ponderings on the 2015 NFL Season and then we’ll dive into the 2015 season. Okay, one comment. He’s right. Players don’t want these games. Fans don’t want to pay for these games. But none of this will change until the players go into a labor negotiation with ownership and actually negotiate. You know, ask for stuff and then fight for that stuff. IS 2014 DL BETTER THAN 2013 ON PAPER? Jared Allen or no Jared Allen, the Bears’ projected defensive line going into 2014 is arguably not as good as the one positioned to take the opening opponent’s snap in 2013. Everyone needs to stop with the Corey Wootton/Stephen Paea stuff. Without seeing these two players as overwhelming positives there was no way for Moon to make the statement his column makes and neither Wootton nor Paea is an overwhelming anything. They were and are below average defensive linemen who’ve been overly celebrated due to a dearth of talent along the line. The Bears now have three defensive ends (Houston, Young, Idonije) better than their second best defensive end a year ago. 2014 Jared Allen is an upgrade over 2013 Julius Peppers. What do the Bears still lack? An interior pass rusher. That is why I stand by my belief that Phil Emery should swallow his mysterious medicine and draft the best defensive player in college football last year, Aaron Donald. Each weekday afternoon, at 5:00 PM EST, the NFL Network airs something. I hesitate to call this something a television program because, you know, The Twilight Zone was a television program. All in the Family was a television program. CBS Evening News with Walter Cronkite was a television program. NFL Fantasy Live is not just sixty minutes of daily recorded garbage. It is also a symbol of the shield’s greatest hypocrisy: embracing the eh, we’re fine with it gambling of fantasy football while using their legal infantry to thwart the sorry, can’t have it gambling of point spreads, over/unders and the type of wagering that greatly helped build the NFL into the athletic superpower its become. HOW DOES THE NFL VIEW FANTASY? While addressing the league’s aversion to all forms of gambling, Goodell was asked about fantasy football. Fantasy football: bringing families together since Roger Goodell said so.